CIA Torture: It Was All About Making Money, Lots Of It…..
A central thesis of James Risen’s new book on America’s eternal war against terrorism – Pay Any Price: Greed, Power and Endless War – is that it is fueled by money and greed and facilitated by the fact that early on in the Bush administration, much of the business of combating the Islamic threat was contracted out to private corporations. Obama has continued the trend. The consequences of injecting a profit motive into any human activity, especially where it should not belong, are completely predictable: in order to maintain a growing cash flow and a steady stream of profits when success would ordinarily be measured by their decline, the supplier has to provide the demand for the product. The last thing such an entrepreneur will do is to work himself or herself out of business. The American prison business is a perfect example. Since 1970, America’s prison population has risen by 700 per cent and now stands at well over two million. If America was working properly the numbers in jail should be shrinking not growing. It is no coincidence that the four decades during which this massive expansion happened also were the years of prison privatisation, encouraged by neo-liberal economic policies promulgated by Reagan and Thatcher amongst others. As prisons became more profit-based, policing policies evolved to facilitate the growth of imprisonment (especially of Black men): these included draconian drug laws, three strike laws and ‘Broken Windows Policing’. Reading the Senate report on CIA torture is not a pleasant experience. It is a story of the most cruel torture carried out in the most disgusting ways, sometimes by people who clearly had serious psychopathic problems. But it is moreover a story of failure and lies; the failure of torture to obtain real, actionable intelligence and lies to cover this up, lies to the White House, to Congress, to other intelligence agencies, to the media, to the American people and the world and ultimately to the CIA itself. 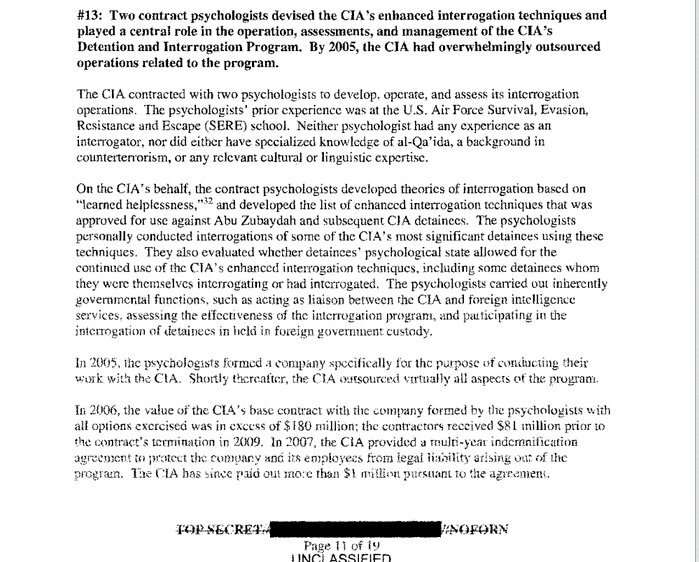 So why did the CIA continue torturing people when it was evidently not producing results? Why not admit early on that torture was a failure and that more conventional methods were more effective, as they clearly were? 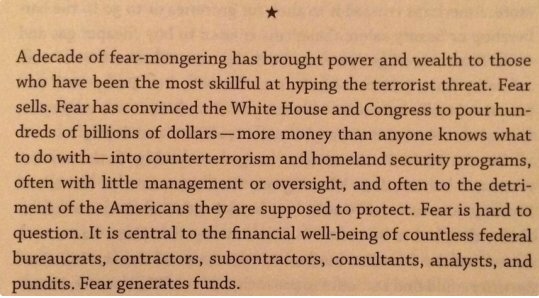 Neither of those two psychologists were going to admit that their business was a complete failure, and risk losing all that money, and none of the CIA bureaucrats who hired them and set them up in business were going to admit they had screwed up. Welcome to America! great piece Ed will repost it if OK.